BATON ROUGE, La.--(BUSINESS WIRE)-- Woman’s Hospital in Baton Rouge and the United Health Foundation today announced a three-year, $1.2 million grant to launch an innovative program at Woman’s Hospital that will help address the needs of pregnant women with opioid addiction and their affected newborns. 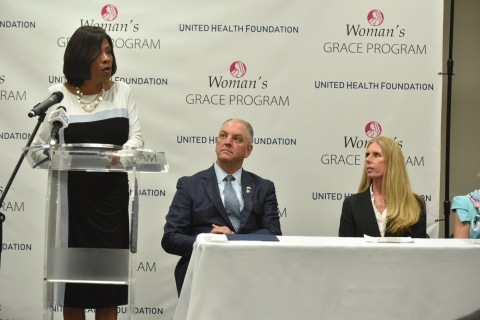 Baton Rouge Mayor-President Sharon Weston Broome helps announce the GRACE program that will help expectant mothers with opioid use disorder as Governor John Bel Edwards and Heather Cianfrocco, UnitedHealthcare Community & State CEO, look on (Photo: Jeff Strout). Louisiana has experienced a 46.5 percent increase in drug deaths – from 12.9 percent to 18.9 percent per 100,000 people – since 2007, according to the United Health Foundation’s America’s Health Rankings. And the rate of pregnant women addicted to opioids at the time of delivery has quadrupled over the past 15 years in 28 states across the country, according to a Centers for Disease Control and Prevention study. Maternal addiction can lead to Low Birth Weight infants though either premature labor or through Intrauterine Growth Restriction. Opioid exposure in the womb can have far more serious health effects for babies due to NAS, which can cause a high rate of neurological injury, and death due to the neurological impact of opioid withdrawal. Woman’s Hospital in Baton Rouge, Louisiana is one of the first specialty hospitals for women and infants. Since opening in 1968, it has welcomed more than 300,000 babies, making it one of the largest delivery services in the country and the largest in Louisiana. Additionally, Woman's operates the largest neonatal intensive care unit in the state and cares for infants who are extremely premature, are critically ill or require surgical intervention. The hospital is also recognized for its expertise in mammography as well as breast and gynecologic cancer care. As a private, nonprofit organization, all funds are reinvested into the hospital to continue Woman's mission to improve the health of women and infants through the latest technology, a highly qualified staff and critical community programs and services. For more information, visit www.womans.org. 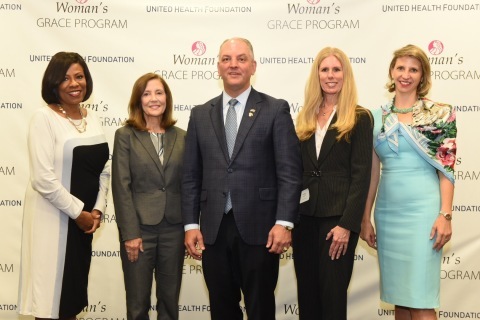 Baton Rouge Mayor-President Sharon Weston Broome, Woman's Hospital CEO Teri Fontenot, Governor John Bel Edwards, Heather Cianfrocco, UnitedHealthcare Community & State CEO, and Louisiana Department of Health Secretary Dr. Rebekah Gee announce the launch of the GRACE program at Woman's Hospital (Photo:Jeff Strout).